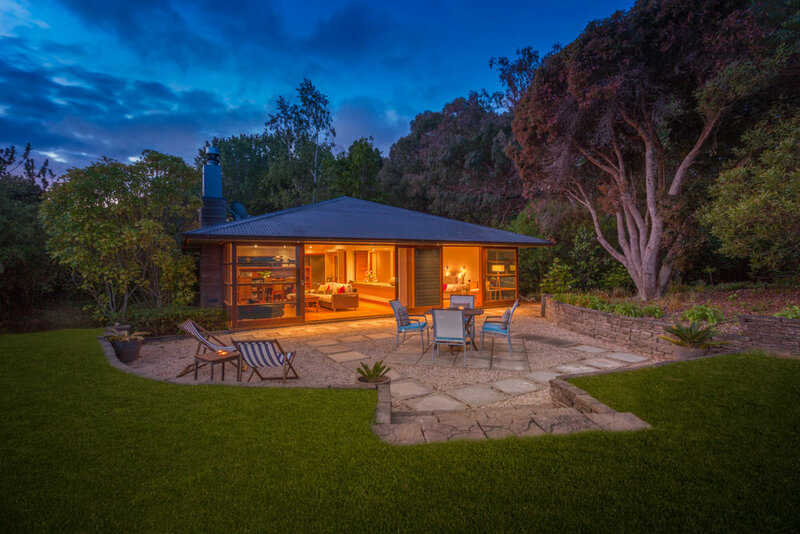 Set in beautiful private gardens overlooking Tasman Bay. Te Koi sits on the shore of the Waimea Estuary and offers a very special experience with warm Kiwi hospitality. The self-contained villa at Te Koi on the shore of the Waimea Estuary. 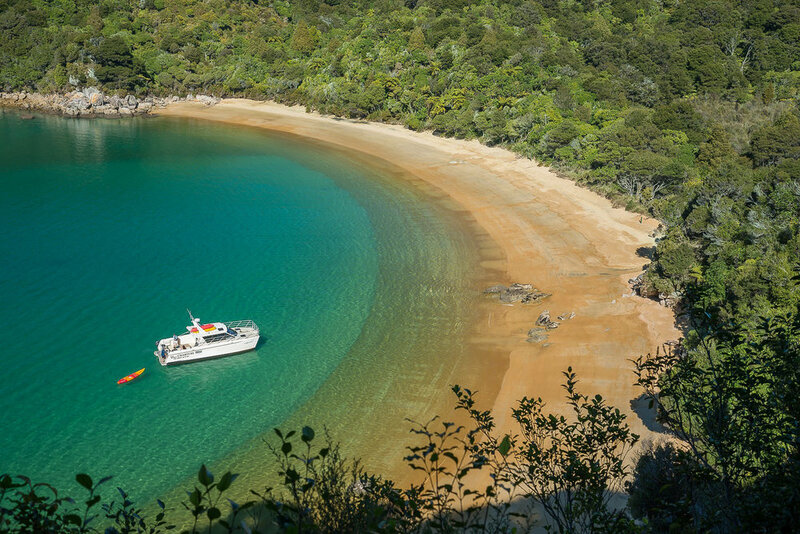 Explore the hidden coves and bays of the stunning Abel Tasman National Park on a privately chartered boat tour. 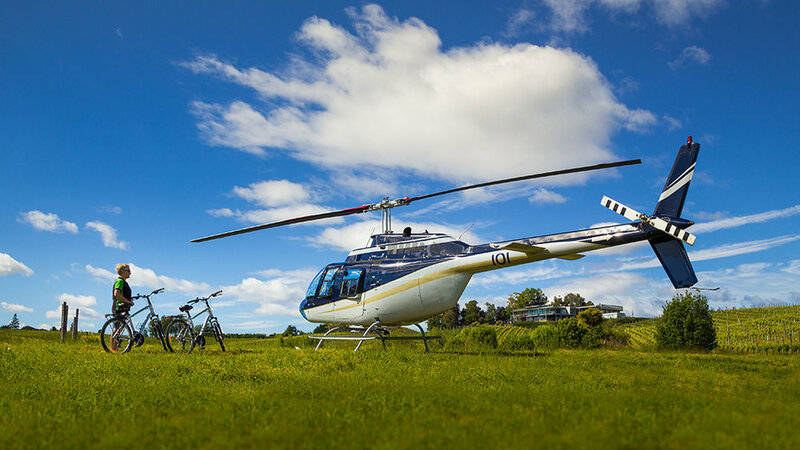 Reach into the heart of our region where few visitors can go - a heli-tour, with or without bikes is a popular additional option with the luxury package. Combine the best of both worlds by staying in luxury accommodation while enjoying a bespoke cycle tour. Our two base tour allows our guests to enjoy both the coastal locations of Clifftops Retreat, Split Apple Retreat or Te Koi the Lodge with additional nights at ‘Edenhouse’, the boutique luxury lodge in the heart of the countryside. Edenhouse is considered to be in ‘the 101 best hotels in the world’. It is set in 48 acres of private grounds and surrounded by quiet country roads. The Great Taste Trail is only a couple of Kms away from its door. This provides a perfect location to cycle to or from. The luxurious surroundings, the exceptional cuisine, and the legendary hospitality of your hosts, Peter and Bobbie Martin, make this a wonderful location to return to after your day’s cycling. What's Included: Top of the range trail bikes, helmet, pannier day bag, hi-vis vest, water bottle (local spring water) and snacks. When staying at Edenhouse or Split Apple Retreat or Te Koi, breakfasts and dinners included, café lunches on cycle routes ( guided options). Private tour with transfers as required for selected routes. Enjoy exclusive use of one of Nelson’s luxury lodges, with self-catered or fully catered options available. Multi-day bespoke itineraries can be created around your choice of accommodation. The area has so much to offer and cycling is the perfect way to experience the landscape and the locals. A multi-day tour could involve cycling every day or some days could include alternative activities. We are happy to offer or arrange heli-tours, private boat charters, eco-tours, vehicle based winery and art tours or vehicle based tours specific to your interests. This bespoke tour allows our guests to enjoy sections of The Great Taste Trail at a pace that suits them. Our knowledgeable guides can also find, off trail, quiet country back roads that take our guests to places most people don’t know exist. Experience the tranquility of the countryside, hop gardens, vineyards, orchards, majestic rivers, with a stunning backdrop of Kahurangi National Park. All this and yet never too far away from a coffee stop! The accommodation at Clifftops Retreat is a 1,100 sq ft self-contained villa perched high on the cliffs near Nelson, overlooking sandy beaches, the glittering Tasman Sea and the sparkling lights of Nelson. It is a spectacular location. A spa pool set right on the cliff edge offers you breathtaking views while you relax. Quiet and private, it is still within 10 minutes of some excellent restaurants if you wish to eat out in the evenings during your stay. Before we set off, or before you arrive, we will discuss the type of cycling and routes you would prefer to do. As this is a private tour, we can alter the distances and routes you would like to cycle. Of course, your bikes will be brought to the door and will be sized and adjusted to fit your particular needs. We provide all you need for a great day’s cycling. This package will be a 'stand out' experience for anyone visiting the region, whether from overseas or New Zealand. What's Included: Top of the range trail bikes, helmet, pannier day bag, hi-vis vest, water bottle (local spring water) and snacks. Breakfast pantry provisions and café lunches. Private guided tour with transfers as required for selected routes. Fitness level: A basic to moderate level of fitness required.